Is almost too simple perhaps. Manufactured in Kitchener, alias Berlin. Basically my way home landscape. It was a map too! A mile to a mile. Save this one and a path. Too big to be taught. “Maps” is from Souwesto Home, a collection of James Reaney’s poems from 2005 and published by Brick Books. Listen to Jeff Culbert perform “Maps” here. 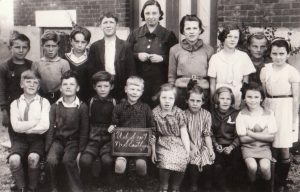 The pupils of Elmhurst School with their teacher, Miss Helen Coveney, in 1936. 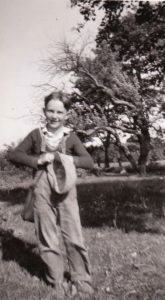 James Reaney (age 10) is in the top row, third from the left.